Engineers are a creative bunch. Technology has become so advanced these days that if an engineer can imagine it, it can probably be built. Here are eight great tech innovators in the realm of engineering. We take aspects of health care for granted, but that’s only because we can afford them. What about people who live in countries where finding the resources to simply live through the day is challenge? Manu Prakash is helping to advance what he calls ‘frugal science’ – the manufacture of universally affordable healthcare instruments. He has already developed a piece of kit that can detect malaria in a single drop of blood, and the device costs less than a national daily newspaper. If you have a video with no sound, then Abe Davis and his team of MIT researchers can help. They’ve devised a way of extracting audio from silent videos. They measure the tiny vibrations of items filmed by a camera, and reconstruct the sound. Cancer remains one of our biggest killers, but people like Nat Turner and Zach Weinberg are among the people who are hoping to change that. They have developed a software platform that enables cancer centres all across the US to work in collaboration to develop a cure. Google bought Turner and Weinberg’s company – Invite Media – in 2010 for $80 million, and four years later invested a further $100 million. By May this year Invest Media’s Flatiron Health initiative had secured over $139 million in funding. The saying ‘physician heal thyself’ certainly applies to Hugh Herr. 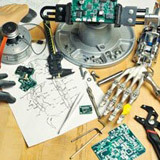 He has helped to design and develop advanced bionic limbs, and is a double amputee himself. The limbs he helps to develop use microcomputers that respond to aspects of limb movement such as gait and the pressure on joints. The results are limbs that respond in exactly the same way that biological limbs do. The documentary ‘The Incredible Bionic Man’ has helped to dispel some of the stigmas surrounding physical disability. The host of that documentary was Bertolt Meyer, who himself wears an artificial limb – a prosthetic hand known as an i-limb. People with physical disabilities have been wearing prosthetic limbs for decades, but ‘wearing’ and ‘using’ are two very different aspects of prosthetics. John Donoghue is leading research in ways in which amputees can control limbs simply by their thoughts, in exactly the same way that they would control a biological limb. Coulter is the project manager at DEKA Research and Development. He is helping develop what has been dubbed the ‘Luke’ arm – named in honour of Star Wars character Luke Skywalker. This robotic arm is the most complex prosthetic arm that has ever been developed, and enables users to perform tasks that normal prosthetics have never been able to complete, such as unlocking doors and using chopsticks.